This image from NASA's InSight Mars lander, taken on Jan. 7, 2019, shows the SEIS seismograph instrument deployed on the Martian surface to measure Marsquakes. NASA's InSight Mars lander is officially hunting for quakes on the Red Planet. The lander's ultrasensitive seismometer, called the Seismic Experiment for Interior Structure (SEIS), has passed its initial tests and is working working well, according to the French space agency CNES, which built the lander's instrument. The InSight lander touched down on Mars Nov. 26 and used its crane-like robotic arm to deploy the SEIS instrument on the Martian surface on Dec. 19. On Jan. 1, InSight celebrated the new year by testing the seismograph, CNES officials said. 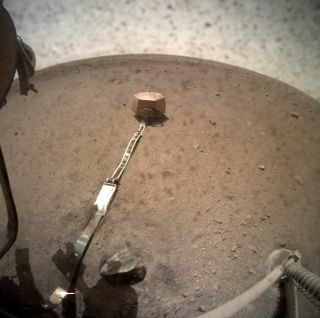 InSight will soon deploy a special cover over the SEIS instrument to protect it from the Martian wind and extreme temperatures. SEIS is the first seismometer to successfully begin work on another world since NASA's Apollo 17 moon landing in 1972, when astronaut Harrison Schmitt deployed a that mission's Apollo Lunar Surface Experiments Package — a sensor suite that included a lunar seismometer, CNES officials said. SEIS is made up of three ultraprecise seismic sensors surrounded by a vacuum inside a titanium sphere. An electronic tether to power its systems and heaters was deployed on Jan. 6, and the SEIS sensors "are beginning to record minute ground displacements." according to CNES. InSight's SEIS instrument is one of two tools the lander will deploy on the surface of Mars. The other is a burrowing tool called the Heat Flow and Physical Properties Probe, or HP3. Mission scientists will use the sensitive seismometer to detect Marsquakes, meteorite impacts and to study the structure of the interior of Mars, with the HP3 tool recording observations on how heat moves through the planet's surface. InSight also carries a radio experiment to help scientists study the planet's wobble. NASA launched the $850 million InSight lander (its name is short for Interior Exploration using Seismic Investigations, Geodesy and Heat Transport) in May 2018. It is expected to study the interior of Mars for at least one Martian year, which is about the equivalent of two Earth years.